“Race teams win with constant improvement and development, and a break in running from track to track gives us the opportunity to take what we learn during those events and make the car and team better,” James Clay. The checkered flag flew over the last GRAND-AM Continental Tire Series event nearly two months ago at Road Atlanta in Georgia, and with that extended hiatus about to draw to a close, BimmerWorld and the rest of the competitors in the Street Tuner class will reconvene this weekend for Round 5 of the Championship at the legendary Mid-Ohio Sports Car Course in Lexington, Ohio. The long pause between events afforded the BMW experts plenty of time to analyze and improve its trio of BMW 328i sedans—cars that have already been relentlessly optimized by the tuning and aftermarket specialists—as part of BimmerWorld’s quest to win races and the GRAND-AM title. As tempting as it would have been to work shorter hours during the break at the team’s base in Dublin, Virginia, Clay says his crew of veteran technicians and engineers maintained an ambitious pace which should help the program to resume its racing activities at Mid-Ohio without missing a beat. In a similar vein, BimmerWorld’s three driving duos have also been away from the racetrack—at least in professional competition—and like their crew members, have also been staying active to make sure there’s no rust to shake off when practice begins. “All of our drivers are already doing the work in between the races by spending time on the simulator and making sure they are in top physical shape to endure the heat in the cars and length of the races,” said Gregory Liefooghe, who shares the No. 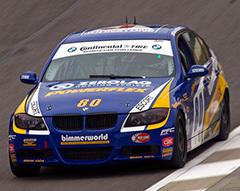 81 BimmerWorld BMW 328i with Tyler Cooke. BimmerWorld continues to work on the 328i chassis to maximize its performance advantages, most notably in the areas of braking and handling. And with a number of smaller, lighter cars in the same class, certain tracks favor specific manufacturers, giving BimmerWorld’s BMWs a chance to show off in some—but not all–sections at Mid-Ohio. “I think Mid-Ohio should race well for us this year,” said Dan Rogers, who pilots the No. 82 CRC BRAKLEEN® BMW 328i along with Seth Thomas. “As always, the BimmerWorld BMW’s are rock solid cars from qualifying until the final lap of the race, but this weekend will be tough and there’s no telling how exactly it will play out.